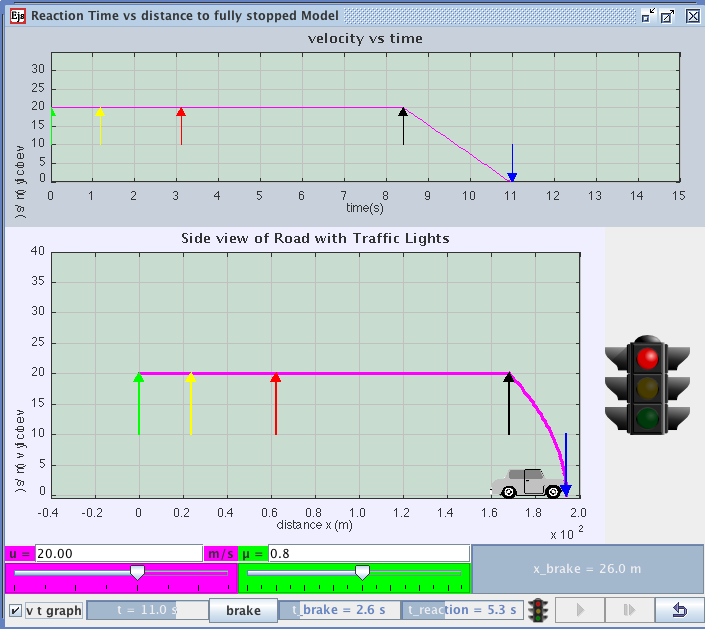 I have created a reaction time measurement java applet 10 years ago with JDK1.0.2. This is the EJS version of the same applet. You can see how it was created with ejs (and all the model) if you click the link below the applet(Loas it as signed applet). Click after the simulation is paused. Am i doing something wrong or is there some way I can fix it?? Thankyou for your contribution, this website is amazing! Sorry! Because the web site switch to this new forum system recently. Some of the code did not change with the new database. The problem is fixed now. You should be able to download the file. I am so happy to find this! My physical science students are going to really enjoy playing with this! I can make a point about distractions while driving as well as teach a little kinematics at the same time. This simulator is very easy to use. Is there anyway to save the data and perhaps import it to a spreadsheet like Excel? I have been manually recording and entering data in order to graph, etc. Thanks again for a great resource. I just added a button below the applet. Click get x,t data button after the simulations is paused. You wll find (x,t) value in the textarea. You can copy and paste those value into excel to create a plot. Actually, if you download the ejs source code and open it with latest EJS. You can get data sets automatically when you run it as an application. You can manipulate or plot data in many ways. Try it! Fantastic advice. Always nice to see someone who has come out the other side? I just tried it with firefox,IE and chrome. It works find with all of the above browser. You might want to check if your browser support java (or enable java). I need to enable java when run it with chrome broswer.